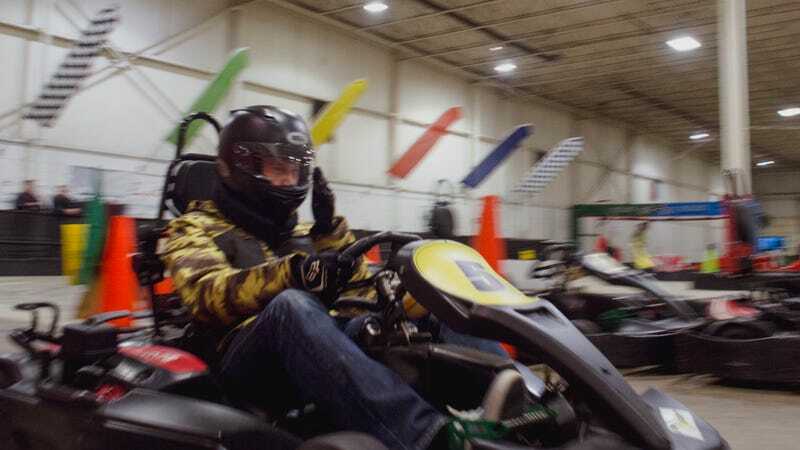 If you missed our annual pre-Detroit Auto Show karting event last night, I’m sorry to say you missed a good one. T-shirts! Trivia! An art car! Trike racing! Brutal contests of speed! A fine time was had by all. A full contingent of 96 readers lined up to test their mettle at Kart 2 Kart’s new revised counterclockwise course, while probably another 20 or 30 were onhand to enjoy some pizza and good conversation. We also gave out Jalopnik shirts to those who were obsessed enough to answer my obscure trivia questions. And we started the day with a relay tricycle race, which is MUCH HARDER than it looks in the pictures. Everything hurts so, so bad today. I was pretty pleased with myself as I ended up the fastest Jalop alongside actual fast person Anthony Magagnoli, whom I deputized for our team in hopes of helping us compete against some of the die-hard maniacs and racers who show up to these things. But in the end, we can’t all be astronauts. Three readers took the podium after a showdown between the quickest qualifiers: top honors went to winner Brian Parme, second place went to a mysterious fellow known only as “F1RACER,” and third place went to Cole Leether. Once again, thanks to all who came out, and very special thanks to our good friends at Kart 2 Kart. This is one of my absolute favorite events we do every year, and it’s a great example of how you all comprise the finest community of car enthusiasts on the internet.